Newborn Hope Presents November Noel – Save the Date! More than 500 industry leaders, medical professionals and dedicated friends of the organization will come together at The Broadmoor Hotel’s International Center in Colorado Springs on Friday, November 16, at 6pm for a welcome champagne reception with silent auction, elegant dinner and program, and live auction. Every week, an average of 158 babies are born preterm in Colorado, and prematurity is the leading cause of death in newborns in our state. Additionally, with the rise of the opioid crisis in our nation, the number of substance exposed newborns in our southern Colorado hospitals has doubled since last December. 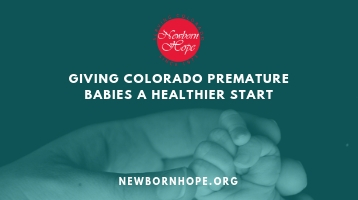 We strive to make a difference and have significant impact on Colorado babies, and with your help, Newborn Hope can serve the most-needed programs in our cities and rural communities. Every dollar raised by Newborn Hope supports preterm babies in Colorado.